Meanwhile, the nation’s left-wing ideological leaders, including “democratic socialist” heroine Rep. Alexandria Ocasio-Cortez (D-NY), celebrated the strike, objecting to what they called the “privatization” of schools. Due to our school’s low enrollment, an English teaching position was cut halfway through the fall semester. Charter schools are publicly funded but are not governed by a local district. In other words, charters schools run more like private schools with little oversight. Most charter school employees are not unionized; therefore approving more charter schools is one way to weaken the UTLA. Time magazine agreed that the “growth of charter schools as a central issue in the nation’s second-largest school district,” where one in five students now attends a charter school rather than a traditional public institution. Charter schools are especially favored by black and Latino families precisely because they offer an escape from failing public schools in the inner city — which, many argue, are failing partly because of the control the union enjoys. The unions — which are backed by the Democratic Party machine in California — were able to defeat charter school advocate Marshall Tuck for the second time in the race for state school superintendent last November. But charter school advocates won two seats in the L.A. Unified School District elections the year before. And last year’s Supreme Court decision in Janus v. AFSCME freed public employees from having to pay mandatory dues to the union. 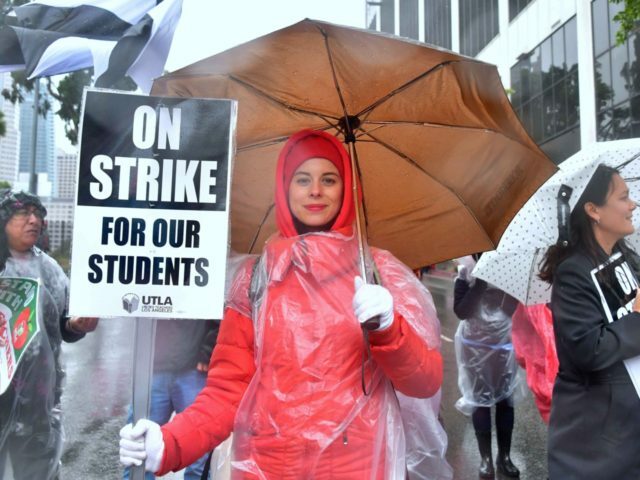 The L.A. teachers’ strike is an attempt to protect the unions’ political power. The problem is that the district literally has nothing to give them: it is already making massive staff cuts to avoid bankruptcy and takeover by L.A. County.